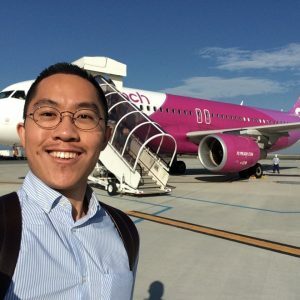 Flying with a Japanese low-cost carrier (LCC) is a unique experience. Japan has some of the most unique low-cost carriers in the world, each with its own personality and attributes. Personally, I love Peach for its model LCC terminal at Kansai and its attractive buy-on-board menu, but the airline is also well-known for its social media campaigns and open corporate culture in Japan. In Japan, the airline is given the name “The Flying Train” because it is safe, easy, and cheap. 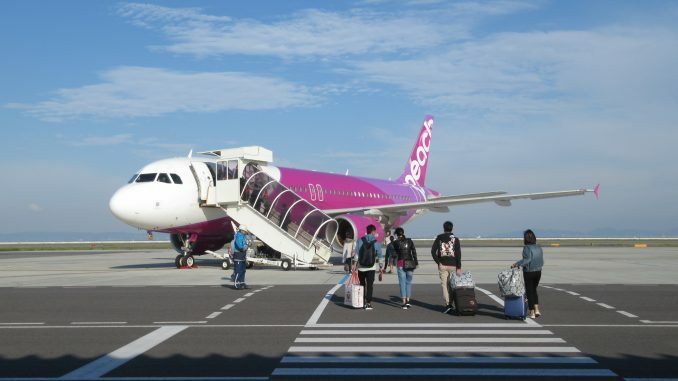 Peach, officially Peach Aviation, is one of two local low-cost carriers based at Kansai Airport. The airline is owned by All Nippon Airways (ANA) and very soon will take over Vanilla Air’s operations (also owned by ANA) to become the leading low-cost carrier in Asia. 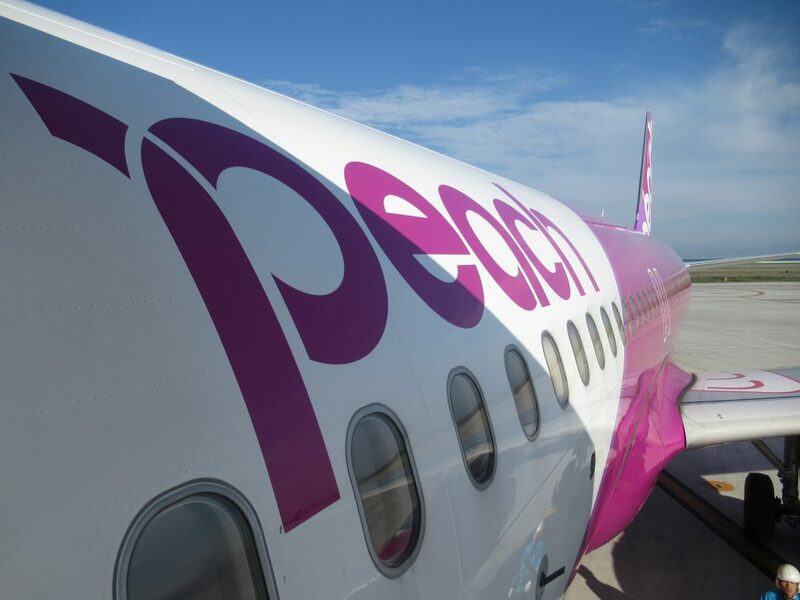 Peach currently flies to several destinations across Japan and Asia, and there are future plans to enter the mid-haul LCC market to fulfill the growing travel demand in Asia. The Osaka-based airline will be taking delivery of more than ten A320neos by 2020. On this trip, I flew from Osaka’s Kansai Airport to Taipei returning from a summer jaunt in central Japan. This Peach route operates approximately two times per day in each direction and attracts mostly vacationers and a couple of budget travelers on business. The route to Taipei from Osaka is actually pretty popular and is served by eight different airlines flying daily. Japanese low-cost carriers have amazing flash sales for their domestic and international flights. I subscribe to a few of their news blasts — which are in Japanese — and settled with Peach for having the lowest fare from Osaka. For my trip flying to Japan, I went with Jetstar flying to Nagoya and then traveling down by train to Osaka to catch my flight. The flash sales often take place every two months and are announced at least two days before the start of the sale. Reserving seats and checking-in bags on the airline is extra, however, 10 kilos are permitted free on the cabin. The airline didn’t bother to weigh each passenger’s carry-ons when I flew, but don’t count on getting past the gate agent if you have an over-packed carry-on. 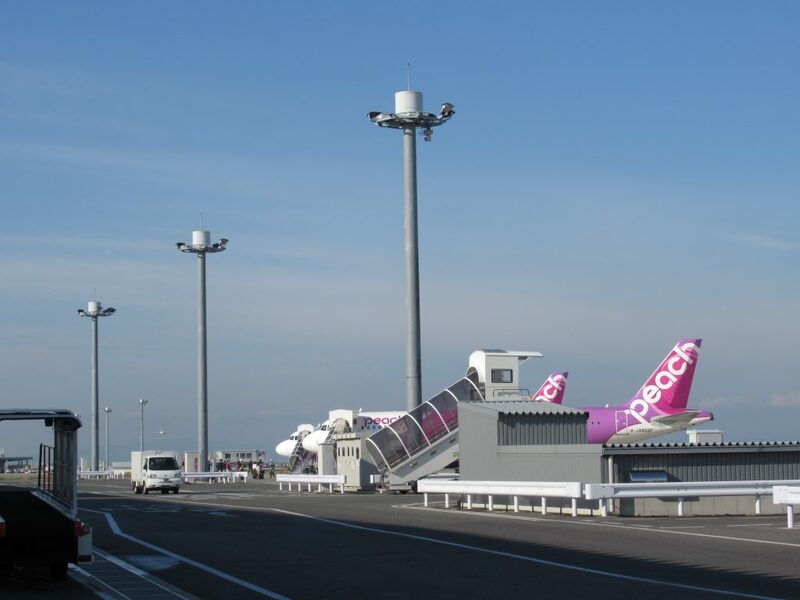 Being a low-cost carrier, Peach operates from an LCC terminal, Terminal 2, separate from all other airlines operating from the main terminal building at Kansai Airport. 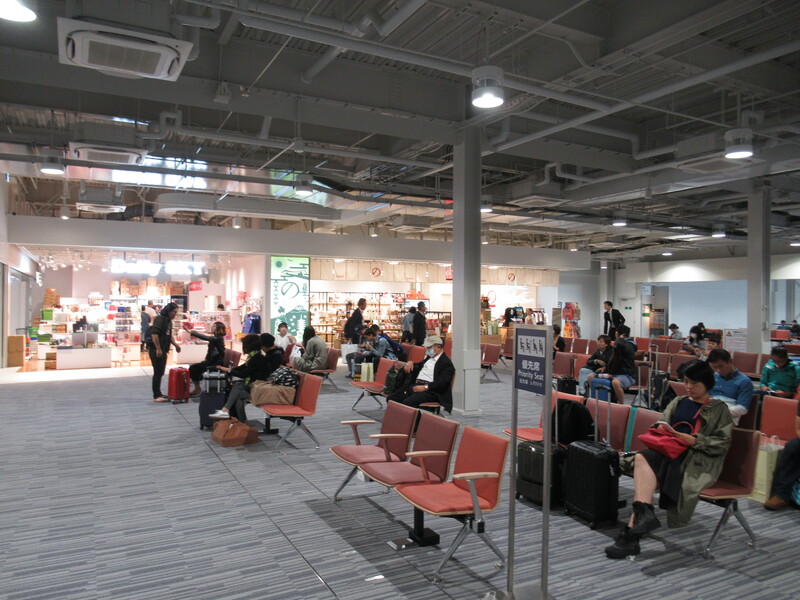 The terminal was originally built to accommodate the several international and domestic LCCs flying into Kansai when it opened in 2012, however, the other LCCs are still operating from the main terminal. The terminal is exclusively occupied by Peach and China’s Spring Airlines at the moment, however, Peach operates a majority of the flights. Terminal 2 has a very simplified design to minimize operating costs. 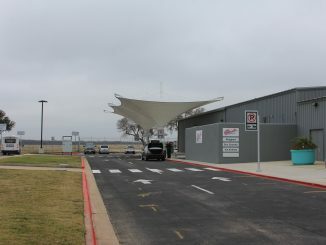 The terminal is essentially a glorified single-story shed with spartan amenities. 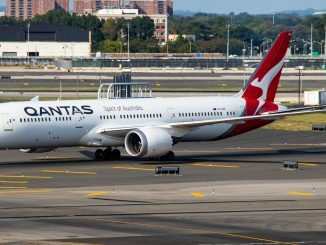 There are no elevators, no jet bridges, no air-conditioning in the passageways, no windows for natural lighting, and only three boarding gates in the entire terminal, one for domestic departures and two for international departures. Peach’s domestic Japan flights are also separated into a different area from their international flights at Terminal 2. After security, the terminal is essentially one large waiting room filled with a sprinkling of colorful upholstered seating options ranging from couch-like seating to standard row-seating. There are only two boarding gates, one for Peach and the other for Spring Airlines, which is almost never used. When boarding is called, travelers are funneled out the door to passageways leading to the aircraft’s location on the apron. Nevertheless, I found the terminal to be very modern in appearance and well-maintained. Terminal 2 is very clean, you could even lie on the floors if you wanted to. Visiting Japan you will notice that it is a country that prides itself on sanitation. The interior has comfortable lighting and the shopping and duty-free options were adequate. The single dining outlet didn’t really attract me, but the prices were quite affordable. As Terminal 2 is located in a more remote corner of the airport, I needed to take a ten-minute bus ride from the main terminal after arriving at the airport train station. I arrived a little bit earlier to the airport than usual to account for the bus ride and the waiting time. This was the only bus I needed to ride for the entire journey though, as though all of Peach’s planes are parked at remote stands, there was no need to get onboard a transfer bus to get there. Peach doesn’t have an option for online check-in, therefore passengers report to the check-in area for their boarding pass before they can clear security. I was counting on long lines to check my bags as I would with any low-cost carrier because of this, but surprisingly I waited no more than 7 minutes after checking in myself from a cardboard check-in kiosk, one of the unique Japanese innovations that Peach is known for. They are just like any typical airline kiosk except the frame is made largely of cardboard and can be easily moved from one area of the terminal to another. 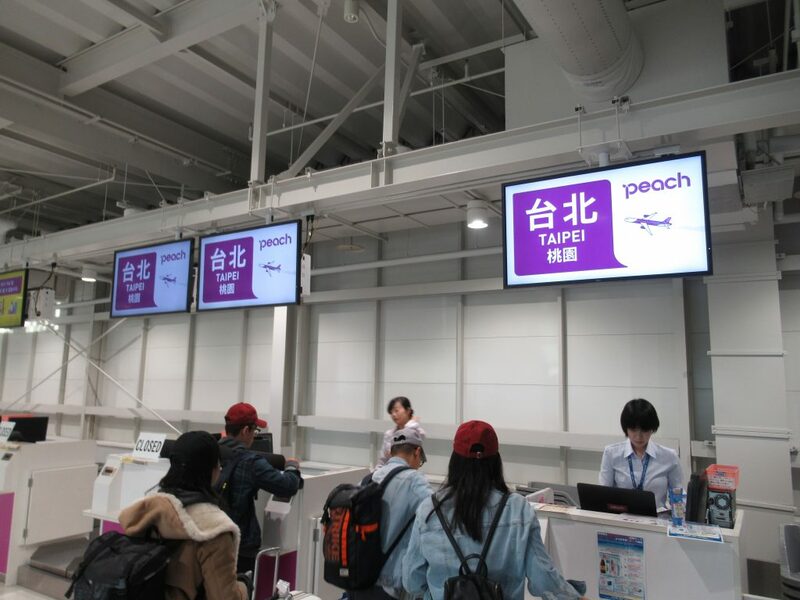 The cardboard kiosks are much cheaper for the airline to update branding and advertising imagery, and it reduced the manufacturing and transportation costs for Peach. I really loved the extra-large screens of the cardboard kiosks. The large screen was not only very attractive but also very easy to use with step-by-step instructions. There was also enough space on the screen for displaying advertising and other promotional content. 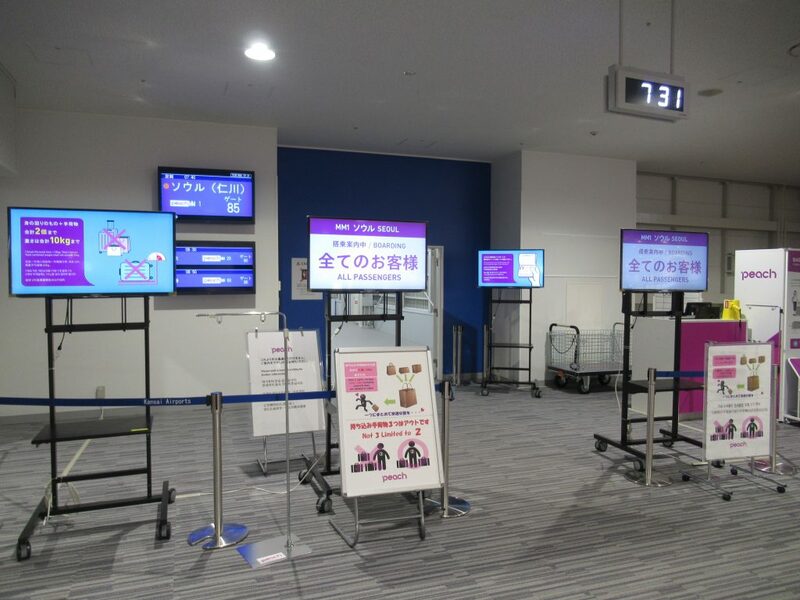 To also make it easier for foreigners, the kiosk also automatically selects the language that was used at the time of booking when you scan your e-ticket QR code. Although it’s an LCC terminal, Peach’s Terminal 2 offers enough shopping to makes sure that travelers are able to spend their last few yen in Japan. 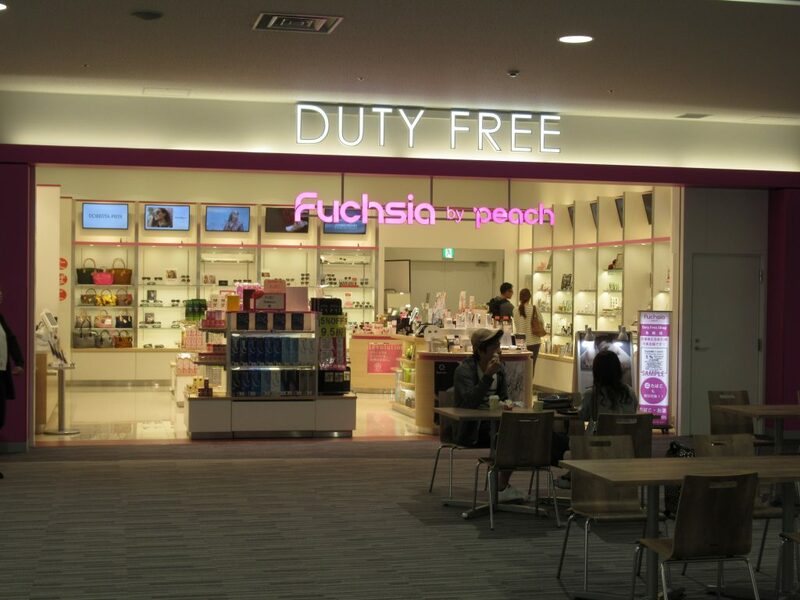 There isn’t that much floor space, but Peach made sure its duty-free shops and stores only sell profitable items popular with tourists visiting Japan, such as local-brand cosmetics and other regional specialties. As an aviation geek, I really enjoyed browsing the Fuchsia Store by Peach which sells several Peach-branded souvenirs. I was pretty surprised it sold everything from playing cards and magnets to baggage tags and office file folders. Apparently, there is a large fan base for Peach-branded products. There were even collectible dolls donning the Peach crew uniform. The only thing they were sold out on were the model A320s. I decided to try my luck onboard, but it was also sold out. It only costed $17 U.S. Dollars. Peach operates 21 Airbus A320 aircraft featuring 180 economy class seats spread across 30 rows. 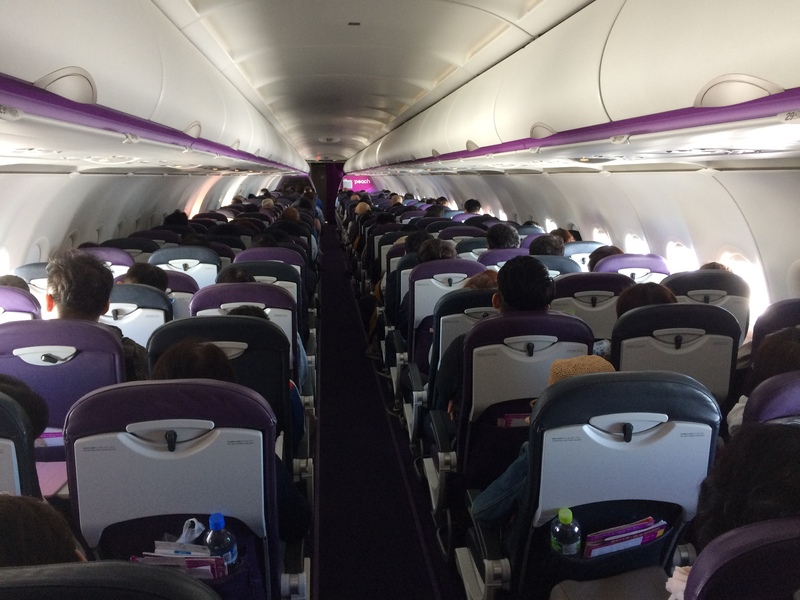 Unlike the hot pink livery of Peach’s planes, the cabin is actually pretty bland looking with only a scattering of violet-colored seats. There are four different seat types according to seat location and the legroom space available. Reserving window seats, no matter the location, is an extra charge as well. I didn’t opt for seat selection and was given a standard middle seat when I checked in at the airport. Peach’s A320 featured slim-line seats which come with a seat pocket, a compact tray table, and a generous reclining function. I found the seat pitch to be very tight at 17 inches, similar to what’s on Spirit Airlines. It was a full flight, and I felt pretty squished sitting in the middle of their compact seats. The tray tables were on the small side, but they are bigger than what you find on Spirit. No in-flight entertainment or Wi-Fi is available on the aircraft, like with most Japanese low-cost flights. For some reason (probably because of all the pinks and purples Peach use in their marketing), I was hoping the cabin would have a fruity aroma when I walked in, but it smelled just like any other airline cabin. If you do want to get that “peach” taste in your system, you have to purchase from their buy-on-board menu. Service from the flight attendants was excellent. I wasn’t expecting much out of a low-cost flight, but their attention to detail and strong grasp of English wowed me. The flight attendants are fairly young and seem pretty new to the airline industry. 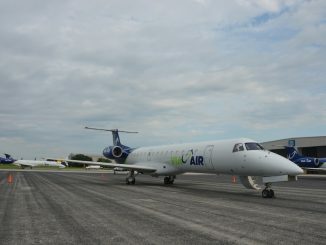 Nonetheless, they had very enthusiastic smiles and made eye contact with the passengers they interacted with. Even though there wasn’t much service to provide, flight attendants were routinely walking around the single-aisle cabin with the buy-on-board menu and providing service with Japanese hospitality. 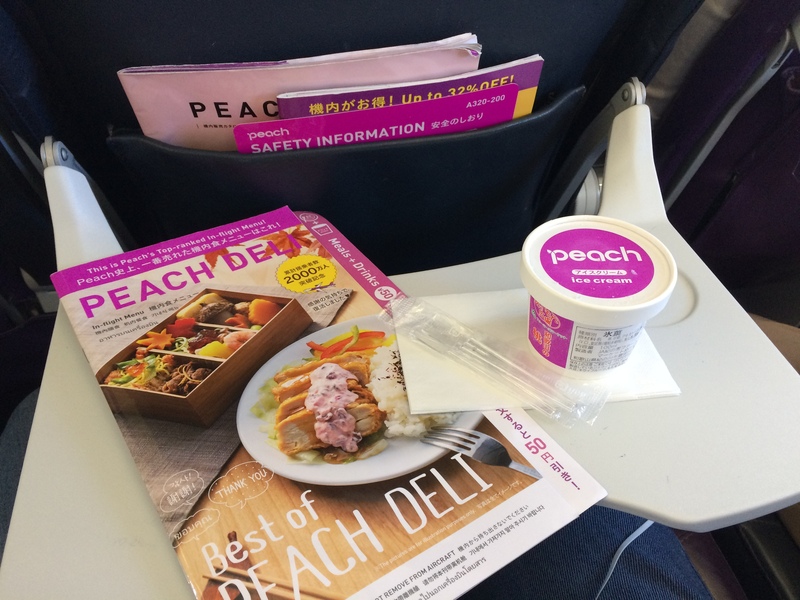 Peach is one of the few airlines to be recognized by CNN for having one of the top-ranked airline meals in the world. Depending on the season you’re flying, the airline dishes out delicious seasonal offerings from Japan, which during the time was a chirashi bento. The meals are not included in the price of the ticket, but the airline offers a wide range of in-flight meals and snacks to purchase on all of their flights. I felt the menu was pretty diverse as it included sushi options, Takoyaki, Okonomiyaki pancakes, Japanese snacks, and even Japanese premium spirits. The prices seemed pretty reasonable considering that their in-flight menu has been recognized by CNN. It looks like Peach also plays with subliminal messaging. Because the airline uses a lot of pinks and purples in their palette, I was really craving a taste of “Peach” from the moment I booked my ticket up to the minute I was onboard the airplane. Not getting a taste of Peach was giving my mouth a bad after-taste, so I really made it a goal to try out the different peach-flavored offerings on the flight. I ended up fulfilling my Peach desires opting for Peach’s signature Peach sherbet and a cup of Peach Melba tea. I was also wanting to order a Peach waffle, but that was sold out. There were also Peach-flavored juice and alcohol available for purchase as well. 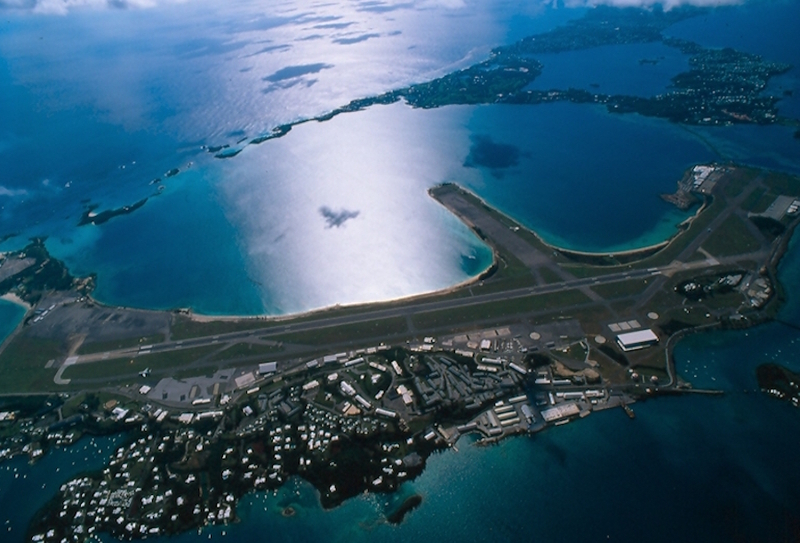 This is one of the best low-cost flying experience I’ve had so far. Buying tickets was simple and easily handled online, and although they don’t offer online check-in, checking in with their cardboard kiosks was fast. The seats on their A320s are on the small side, but the service and buy-on-board food selection were top level. Peach is a great model for low-cost carriers both on the ground and in the air. 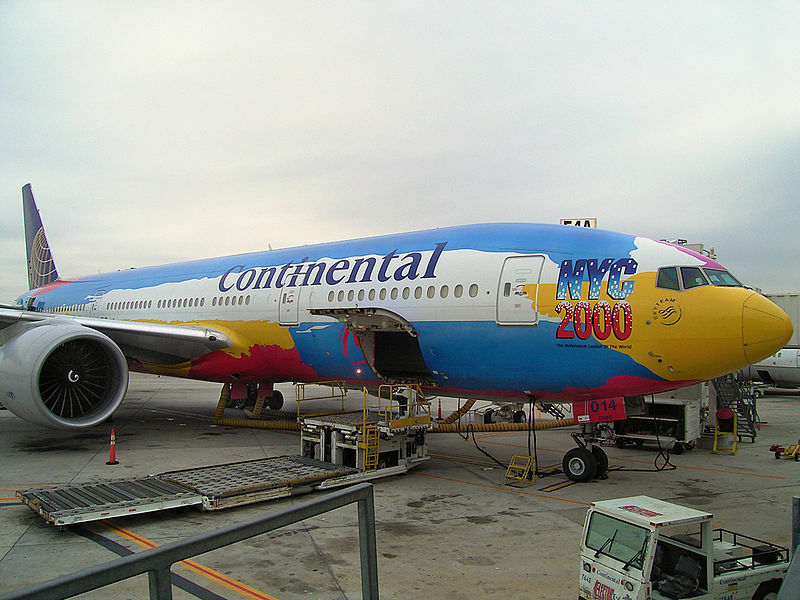 They make the low-cost flying experience quite fun, and that is something very rare when flying low-cost anywhere.